Oz and Mike like to call themselves beer connoisseurs. The beer authorities in a Bud-Light town. Hell, if you were to go to a bar in Ashtabula, OH, the most "exotic" beer you'd find is a Killians. If you asked for an import, the bartender would respond "Corona or Labatt?" We, being the well versed enthusiasts we are, like to expand our knowledge and expand our taste buds any chance we get. Today, if you looked in our fridge, you'd find nine different types of beer. In our thirst for thirst quenching knowledge, we have cuddled many a six packs to sleep and kissed the mouths of strange bottles in stranger places. Throughout our journeys we have sipped the standard black and tan (Guinness and Harp) but it wasn't until August 22nd that we realized the formula was wrong. Over some vinyl Cat Stevens and Donovan, Oz and Mike separately bought Goose Island Oatmeal Stout and Harp. 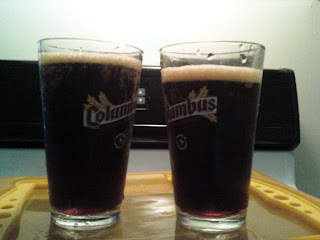 After a sipping down some Summit Octoberfest, we had an epiphany: Why not mix the two beers? Let it be know--- While we have to yet to give any a perfect score, you should comprehend a score above 8 will assure you a brew worth your dollar, time and taste.